I don't know whether Dallas, TX vocalist George Harris really was Jolly but he certainly doesn't sound it on his version of Big John Hamilton's lovely country soul ballad I Have No One. In George's hands the song becomes more bluesy not just thanks to the fine lead guitarist but also to the way Larry T-Bird Gordon and his band have subtly changed the chord progression around. Check out the horns adding to the blue feel of the piece and the fine run out groove. As far as I know this is the only Jolly George 45. UPDATE ~ I'm delighted to say that a member of George's family has been in touch. 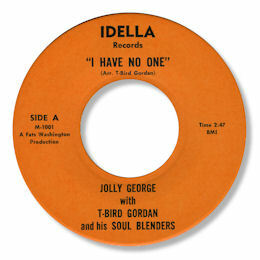 Felicia Hill has kindly written to say "Thanks for posting "IDELLA", sung by Jolly George... He was actually my uncle... My Granny's middle brother. I googled his name today and was not expecting to hear this song.. My granny sang along when I pulled it up and was happy to hear his voice.. Thanks again." Lovely to hear from Felicia like this. Thanks to Dante Carfagna (see Links) for the reminder. Note ~ Both Dante and I think that the Jolly George on Gemini is a different artist.